Krka National Park’s stunning scenery and incredible nature make it a must for any Croatia itinerary. 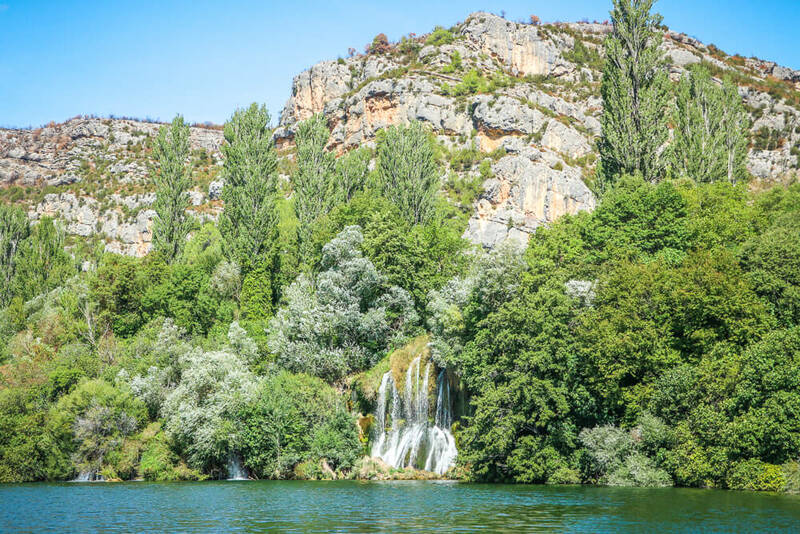 Situated along the Krka river, the park’s beautiful waterfalls help attract so many visitors that a limit of 10,000 visitors at a time has been introduced at the famous Skradinski buk waterfall. As a result, Krka is the second most visited national park in Croatia – with the enchanting Plitvice Lakes National Park being the first. 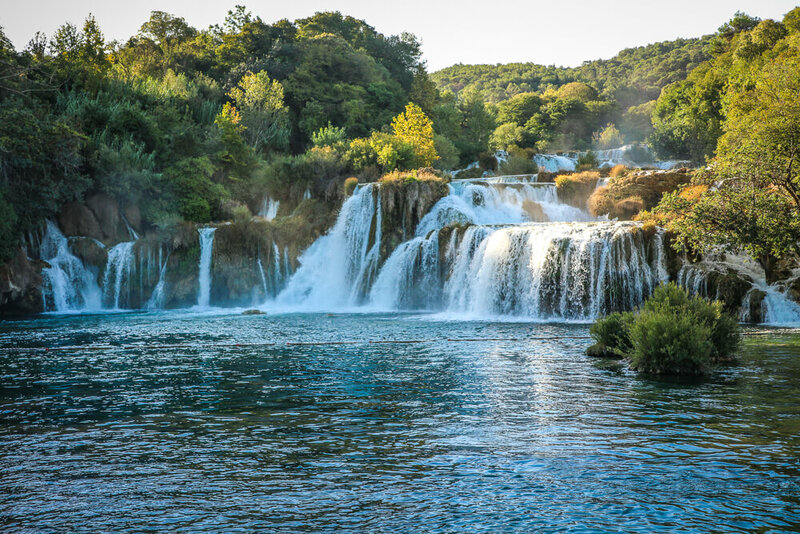 Although many people only come to Krka to swim in the majestic Skradsinki buk falls, there are a number of less visited spots within the park that are worth your time. 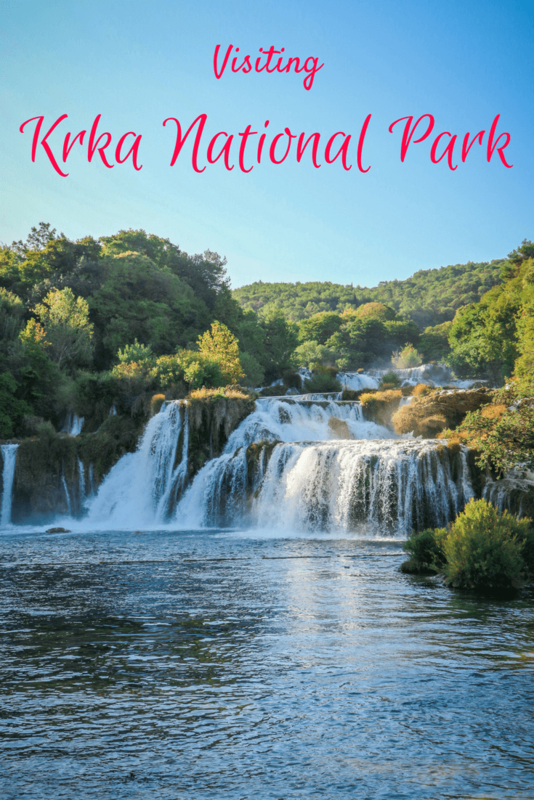 Find out everything you need to know before you visit with this ultimate guide to Krka National Park. Opening times – Krka National Park is open 365 days a year, however some sections of the park are closed between November and March. Fortunately though, it’s possible to visit Skradinski buk (the park’s most famous waterfall) all year round. Opening times vary throughout the year and depending on the site you wish to visit. 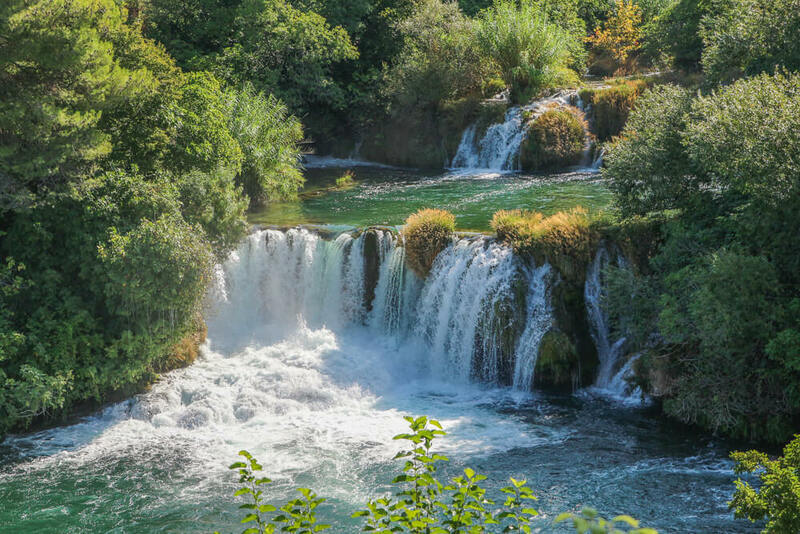 Click here for the Krka National Park’s opening times. Lozovac entrance – The Park’s main entrance, and the closest one to the famous Skradinski buk waterfall. Lozovac has plenty of parking facilities at the entrance, and between April and October shuttle buses take visitors to the beginning of the Skradinski buk trail. Outside of these months, guests are allowed to enter to the beginning of the trail in their own cars. Skradin entrance – This is the second closest entrance to Skradinski buk. Between March and October, you can take a boat trip from the Skradin entrance of Krka National Park up to the waterfall at no extra cost. Click here for the timetable of boats from Skradin to Skradinski buk. If you are visiting outside these months or would prefer a walk, there’s also a 3.4 kilometre hiking path from Skradin bridge to the falls. Parking at the Skradin entrance is slightly more complicated as spaces are very limited. If you opt to drive you’ll probably have to park in one of many unofficial car parks. Prices vary between these, so make sure to check how much you’re paying before leaving for a day in the park. Roški slap entrance – Although parking at the Roški slap entrance is quite limited there should be enough spaces as most guests visit the area via the park’s boats. Burnum/Puljane entrance – Despite being one of the park’s lesser visited sites, there is an official entrance at the Roman ruins of Burnum. Kistanje/Krka Monastery entrance – The final entrance is at Krka Monastery. Although it’s possible to visit by boat, there is a car park on site if you opt to drive. Cost – The entrance fee at Krka National Park varies depending on the time of year and what sites you want to visit. During low season an entrance ticket which grants you access to the whole park costs just 30 Kuna, whereas the same ticket costs 200 Kuna during peak season (July and August). Click here for full pricing information from Krka’s official website. Tickets can be bought upon arrival at any of the National Park entrances, or you can book online in advance via the official Krka National Park website. Parking cost – Parking is free at the official park entrances, although Lozovac has the largest number of parking spaces. Despite Skradin being a very popular entrance to Krka National Park, official parking spaces are extremely limited so it’s likely you will have to pay to use an unofficial car park if you visit via this entrance. Maps – As there are a number of sections of the park to explore, you may need a few maps for your trip. Click here for a guide to Krka National Park, as well as maps for Skradinski buk and Roški slap. Wildlife – Krka National Park is home to some fascinating wildlife. A number of snakes can be found, including the Balkan whip snake and the venomous nose-horned viper. Although a bite from the latter can be fatal to humans, they are unlikely to bite unless provoked and your chances of seeing one are slim as they are generally very shy. Other animals of note within the park include wolves, terrapins and the endangered European otter. On top of this, 20 species of fish and 211 bird species have been recorded within the park. Some of the parks most notable birds include the golden eagle, peregrine falcon and Bonelli’s eagle. Click here for more information on the fauna of Krka National Park. Drive – The best way to get to Krka National Park is to rent a car and drive yourself. Some of the park is only accessible by road, and so without a car you’ll have to miss out certain spots – such as the impressive Manojlovacki slap. As the park has a number of entrances, you’ll need to decide where you want to visit first and follow directions there. Personally we’d suggest you arrive at the main Lozovac entrance and visit Skradinski buk early in the day to avoid the crowds. For directions, we recommend using Google maps if you have mobile data or maps.me if you need an offline map. The length of your journey to Krka will depend on where you’re coming from and which entrance you are going to. Make sure to look up journey times in advance of your visit so you can plan your day accordingly. It’s easy enough to visit Krka National Park on a day trip from places like Split and Sibenik, but it’s too far from Dubrovnik to do in a day. The park itself is located in central Dalmatia in the Sibenik-Knin county. Click here to get a car rental quote for your trip. Tour – One of the most popular ways to visit Krka National Park is on a tour, with many tours offered from Split and Trogir. Due to Krka’s popularity these tours often sell out – so we recommend booking as far in advance as possible! Fortunately, that’s easy to do online! The best value tour we’ve seen also includes stops at the famous Skradinski buk waterfall, as well as Roški Slap, the beautiful Visovac Island viewpoint and Sibenik. Many other tours just include one stop in the park, but it’s nice to see more than just Skradinski buk so you can visit more than just one tiny section! Click here to find out more and book a tour to Krka National Park and Sibenik! Bus – If you haven’t rented a car and don’t want to take a tour, it’s also possible to visit Krka National Park by bus. To reach Krka you’ll most likely need to catch a bus to Skradin, where buses stop just a short walk from the national park entrance. Buses run to Skradin from a number of cities across Croatia including Zagreb, Split and Zadar. For up to date schedule information and to buy tickets online, we recommend using Bus Croatia’s website. If you’re staying in Sibenik you can reach the Lozovac entrance of Krka using regional buses. The timetable for these services can be found in Sibenik’s bus station. Unsurprisingly, the weather at Krka National Park is best during the summer months. As the park gets extremely crowded during July and August, the best time to visit Krka is in May/June and September/October. Not only will the park be less busy, but you also won’t have to pay the higher entrance fee charged during peak season. If you want to swim it’s important to know that swimming is only permitted from the 1st June to 30th September at the Skardinski buk falls in Krka National Park. If you’re not planning to swim then you might want to consider visiting during the winter months – which can also be a great time to visit the Plitvice Lakes. These months see more rain, which means the falls throughout the park will be more powerful than during the warmer summer months. Skradinski buk – For many, the main attraction of Krka National Park is the majestic Skradinski buk falls. This series of 17 waterfalls is spread out over a length of 800 metres, and has a total drop of 45 metres. At the base of the final waterfall it’s also possible to swim in the cool, refreshing waters. To truly appreciate the beauty of Skradinski buk, we recommend making it your first stop in the park. It becomes extremely busy as the day goes on, but if you arrive early you’ll be lucky enough to have the falls to yourself for a short time. By arriving early, we were able to swim undisturbed before the park filled up with visitors! Beat the crowds by arriving to the Lozovac entrance just before opening time. Upon buying a ticket (if you haven’t already online), you’ll have the option to either walk downhill over a distance of 875 metres or take a free shuttle bus – although this shuttle only runs between April and October. As the shuttle only runs when full, we recommend walking down as you’ll probably get to the bottom first! If you are visiting between November and March you are able to drive down to the start of the trail, as the park is less busy during these months. Once you’ve reached the bottom, one of the park’s walking trails will lead you on a 1,900 metre loop through some forest and down to the enchanting Skradinski buk falls. Once you finish the loop, you can either walk back up the trail to the car park or wait for a shuttle bus if they’re running. We’d recommend waiting for a shuttle bus as the trail back to the car park is uphill, which makes it substantially tougher. Remember your swimming gear if you want to swim in Skradinski buk, but be warned the water can be pretty cold! There are a number of rocks to navigate through in the water, so it’s best to use swimming shoes if you have some. It’s possible to buy swimming shoes in Krka National Park at Skradinski buk itself for around 75 Kuna. 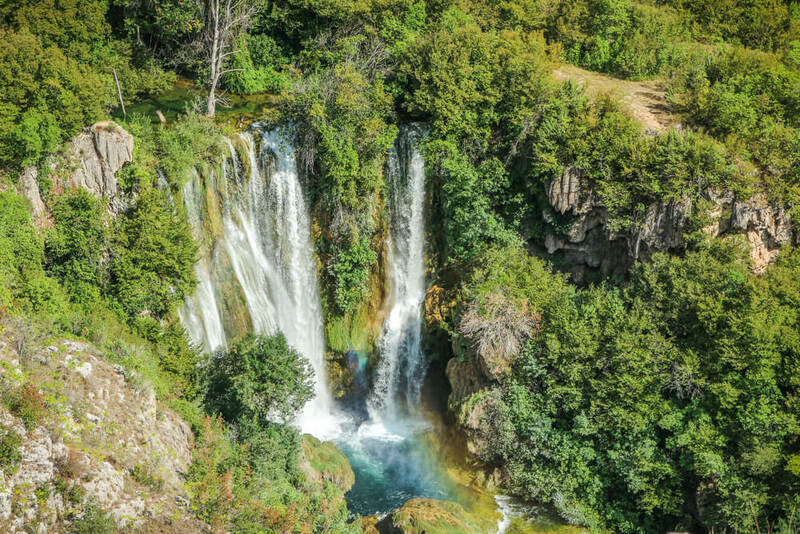 Manojlovacki slap – With a total drop of around 60 metres, Manojlovacki slap is the tallest waterfall in Krka National Park. Its picturesque location in the midst of a canyon makes it one of the most beautiful spots in the entire park. The largest single drop of the falls is 32 metres, sending water powering into the canyon below. Located close to the Burnum entrance to the park, Manojlovacki slap is around a 45 kilometre drive from the Lozovac entrance. Due to the distance from the more famous Krka waterfalls, many people actually miss out this spot. Unfortunately, the park has no transport to Manojlovacki slap, so you have no other option but to make your own way. If you’ve rented a car though, we think it’s definitely worth the extra time to visit this secluded yet impressive waterfall. During some of the warmer months of the year the waterfall can run dry, so it may be worth checking in advance if this is the case. We visited in September and saw the waterfall in full flow, so it’s still possible for it to be running during warmer parts of the year. Krka Monastery – Around 4 kilometres from the village of Kistanje, the Krka Monastery sits in a peaceful location beside the Krka river. The monastery is regarded of as one of the most important Serbian Orthodox sites, with its history dating back to 1345. As the monastery is still in use, guides are mandatory and it’s only possible to visit the orthodox church and the ancient Roman catacombs found beneath it. On top of this, it’s also possible to walk through the grounds down to the Krka River. 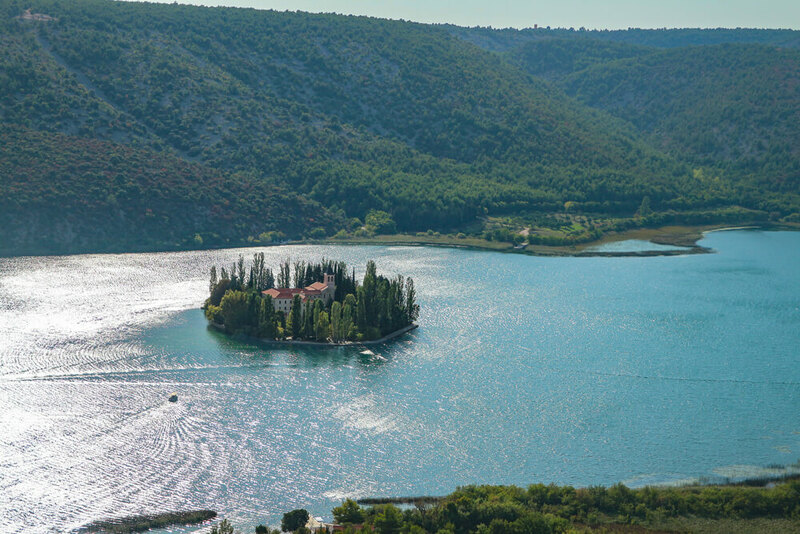 The Krka monastery can be reached by road all year round or by boat from Roški slap between the months of April and October. Visovac – Another of the parks most scenic spots is the tiny island of Visovac. 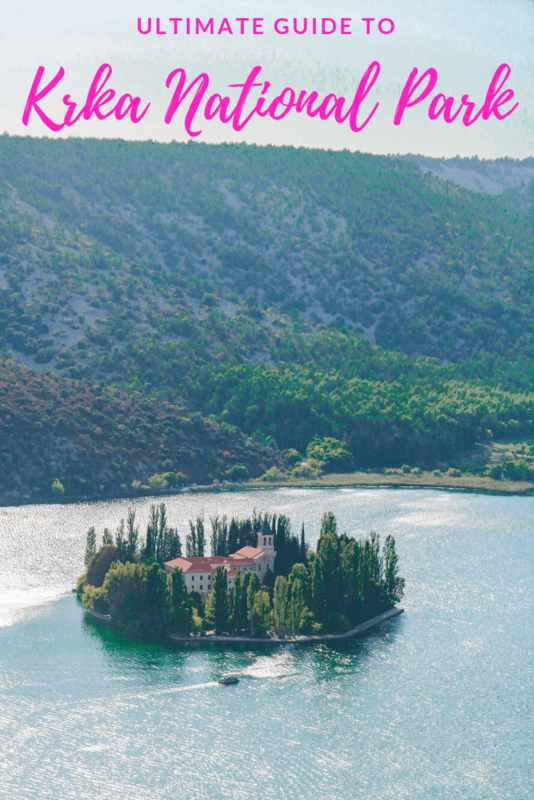 Located in the middle of the Krka river, the island is home to a monastery first established in 1445. Visovac is best appreciated from a viewpoint by the monument to Croatian King Petar Svačić. There is no actual entrance at Visovac, as you only need to stop at the viewpoint for a few minutes to enjoy its beauty. For those wanting to visit the island as well, you can do so by a 5-minute boat ride from either Stinice or Remetic. It’s also possible to visit from Skradinski buk, however the disadvantage of doing it this way is that you won’t get to appreciate Visovac and its surroundings from the viewpoint above. Burnum amphitheatre – The ruins of the Roman military camp Burnum are one of Krka National Park’s less visited spots. Home to an amphitheatre, which it is believed could hold around 8,000 spectators; the site is still undergoing excavation. The Burnum amphitheatre is very close to Manojlovacki slap, so it’s worth a quick look if you’re in the area or are particularly interested in Roman history. Roški slap – The waterfalls at Roški slap are made up of 2 sections – the main falls and what is known to locals as the ‘necklace’. In comparison to Skradinski buk and Manojlovacki slap, the main falls are somewhat average in our opinion. There is a relatively pleasant circular trail around the cascades known as the necklace, however we personally think your time is better spent elsewhere in the park. For a better viewpoint of the necklace you can visit Oziđana pećina cave or climb a steep hiking trail. While the area has some lovely nature, we didn’t feel it was as special as other parts of the park – especially considering more people visit Roški slap than visit Manojlovacki slap. You can reach Roški slap either by car or pay for a boat ride from Skradinski buk. 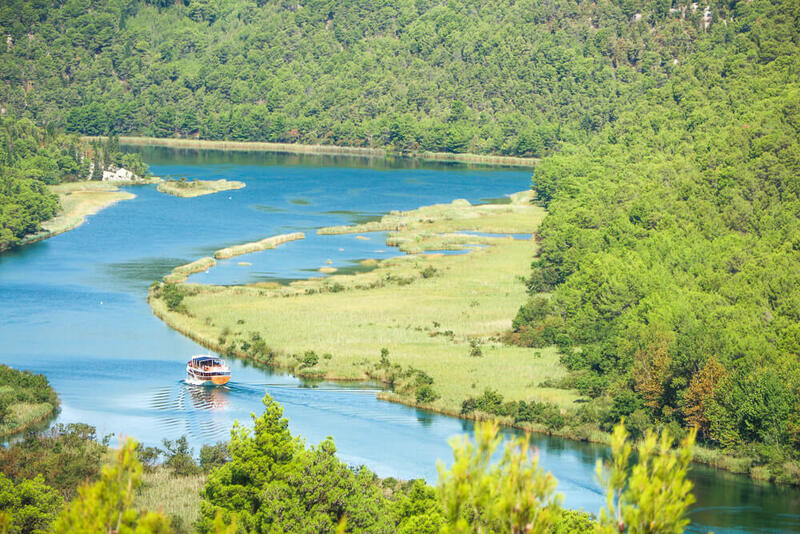 The easiest ways to get between points of interest within Krka National Park are to drive yourself, or make use of transport offered by the park. There are also some hiking trails within the park for those with more time to spend in Krka. Driving – We recommend renting a car and driving around the park in order to see as much as possible. While the boats provided by the park are generally the more popular way to get around, there are a number of places in the park that are only accessible by road. By driving you give yourself full flexibility in terms of exploring Krka National Park, and you aren’t limited as to where you can go. Boats – There are a number of boat rides you can take between points of Krka National Park. While the ride from the entrance at Skradin to Skradinski buk is included in the price of the ticket, tickets for other routes cost between 50 and 130 Kuna. Skradinski buk to Visovac – A 2 hour trip including a 30 minute stop on the small island of Visovac before returning to Skradinski buk. This trip costs 100 Kuna. Skradinski buk to Visovac and Roški slap – A 4 hour trip including a 30 minute stop on the small island of Visovac and 90 minutes at Roški slap before returning to Skradinski buk. This trip costs 130 Kuna. 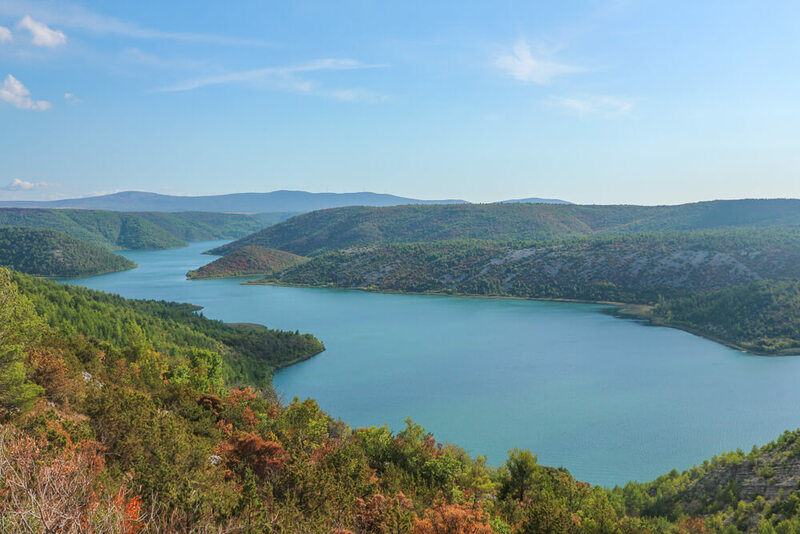 Roški slap to Krka Monastery –A 2 and a half hour trip including a 30 minute stop at Krka Monastery before returning to Roški slap. This trip costs 100 Kuna. Stinice to Visovac – A short boat ride to Visovac island where you will spend half an hour before returning to your starting point. This trip costs 50 Kuna. Remetić to Visovac – A short boat ride to Visovac island where you will spend half an hour before returning to your starting point. This trip costs 50 Kuna. These routes run between April and October, although schedules are set daily for all routes except those departing from Stinice and Remetić to Visovac. The schedule for these routes is found on Krka National Park’s price list. Van/Minibus – In July and August it’s possible to take a van from Roški Slap to Stinice or vice versa for 50 Kuna one way. Due to its proximity to Krka National Park, we recommend staying in one of the hotels in the historic city of Sibenik. Located around 10 kilometres away from the park, it’s the perfect base for a visit to Krka. 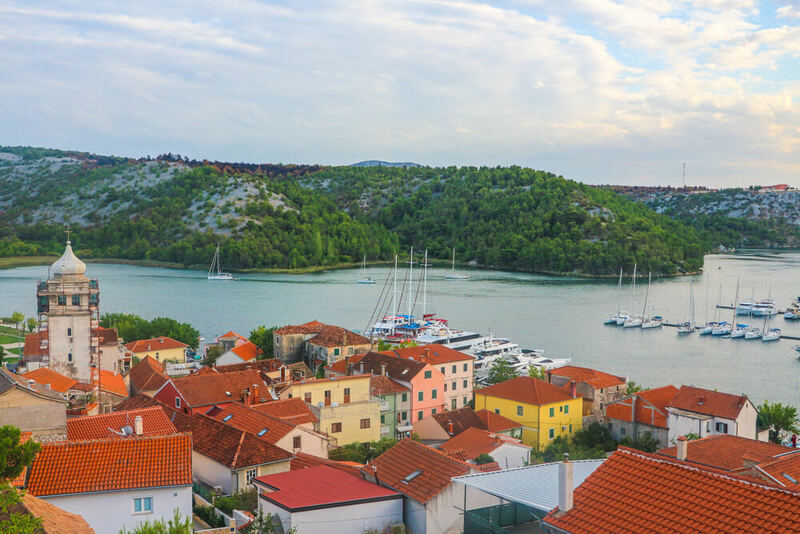 Click here to read our guide on the best places to stay in Sibenik. Arrive early to Skradinski buk – We’ve said it a few times already, but it’s one of the things we cannot stress enough if you want to enjoy the area without crowds. We were the first ones at Skradinski buk when we visited and had around half an hour virtually undisturbed before more groups turned up. Rent a car – The easiest and cheapest way to get around Krka National Park is to drive yourself. There are a number of spots within the park that are only accessible by road, so if you don’t have a car you won’t be able to see them. Bring suncream in summer – Make sure you’re well protected during hot summer days! Bring lunch and water – Although you’re able to get food at some places in the national park, it depends on the location. It’s cheaper to bring your own lunch, so we’d recommend doing that as well as making sure you have plenty of water for the day! Don’t go in July or August – If you’re looking to save money, one of the best travel tips for Krka National Park is to avoid visiting during July and August. Entrance to the park costs 200 Kuna during these months, which is higher than any other time of year. Instead, plan your trip outside of peak season and you’ll pay considerably less as well as having the benefit of the park being less crowded. Obviously this isn’t an option if your trip falls in July or August, but if you haven’t finalised your dates it’s a good way to save money! 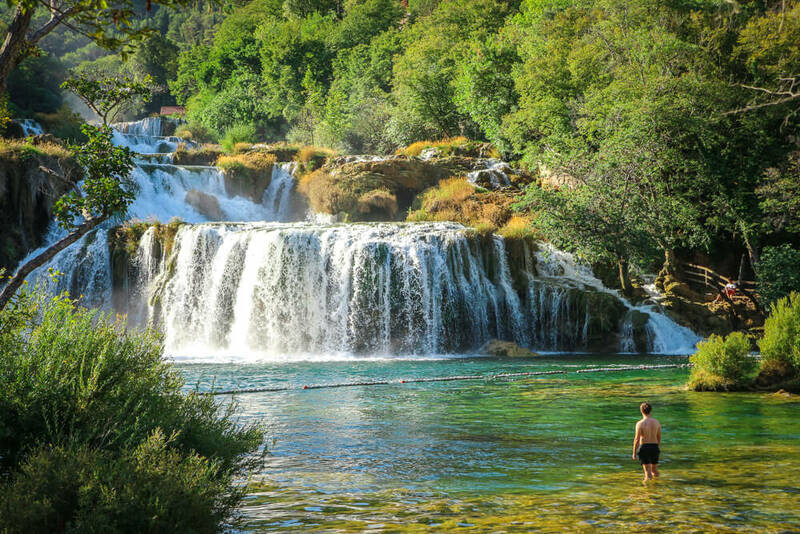 Like this Krka National Park guide? Pin it!